The scientific determination of black fruit wolfberry contains vitamins and fat is much higher than red berries wolfberry. Calcium, magnesium , copper, zinc , manganese, iron, lead , nickel, cadmium , cobalt, chromium , potassium, sodium each element in maintaining the body's normal physiological role has an important role , compared with red Chinese wolfberry , Chinese wolfberry black iron , calcium , magnesium, zinc, copper is much higher than their average levels of potassium , manganese content is much lower than the average , roughly equal to its sodium content . Adults eat about 20 grams of wolfberry more appropriate , you can also change the number according to their taking the situation to achieve the best results so far ; either be placed in the mouth and chewing food can also be soaked in water to drink. We must uphold for a long , eat a little every day , in order to be effective. In addition to the black Goji Berry, our company also offers Organic Goji Berry. Anthocyanin. Goji Powder and Other Goji Products. 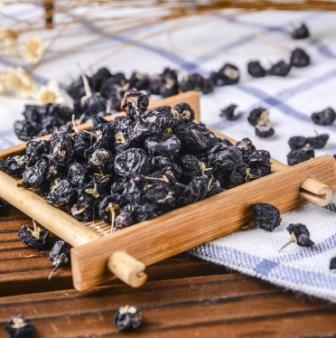 Looking for ideal Wild Black Wolfberry Manufacturer & supplier ? We have a wide selection at great prices to help you get creative. All the Wild Organic Black goji berry are quality guaranteed. We are China Origin Factory of Organic Wild Black Goji Berry. If you have any question, please feel free to contact us.